Gardeners are always looking for ways to maximize yield and minimize effort. The Mittleider gardening method achieves both these aims, and its fans claim it can be used with any soil, in any climate. 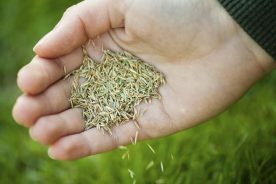 It minimizes weeds, and keeps plants healthy by feeding them custom-mixed fertilizer. Healthy plants are less prone to disease and insect damage. The method is based on years of research by Dr. Jacob Mittleider, and is intended to take all the guesswork out of caring for plants. It can be used on a small scale by a home gardener, or on a larger scale by a market gardener. 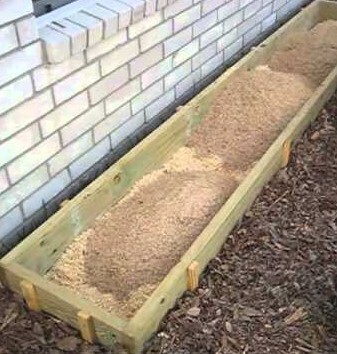 The simplest way to start is with beds using the existing soil, but it can also be used with beds containing a custom blend of sawdust and sand (or similar materials), which allows it to be used to garden on patios or parking lots, or where soil is contaminated. Mittleider gardening method was developed by Dr. Jacob R. Mittleider. Dr. Mittleider had run a successful nursery business for 20 years, and then began traveling the world, educating the local population in 27 countries about how to grow food efficiently. Eventually, he realized that the challenges faced by gardeners everywhere are the same: pests, disease, and plant nutrition, and that the first two were greatly influenced by the latter. He focused his work on plant nutrition, and developed a method to grow food anywhere, regardless of soil or climate, by using a specially-formulated fertilizer mix and targeted watering. He eventually formed an organization, The Food For Everyone Foundation, to distribute his writings and provide training in the Mittleider method. Mittleider died at the age of 88 in 2006, but the Foundation, under the guidance of his protégé, Jim Kennard, continues to promote his gardening method. It carries out educational programs and gardening projects in various countries, including The U.S.A., Armenia, Russia, Mexico, Honduras, Japan, Papua New Guinea, and numerous countries in Africa. The Mittleider gardening method is a science-based method. It centers around growing plants in the ground (Grow Beds) or in raised beds (Grow Boxes) and delivering a carefully designed set of nutrients to the plants; first, when planting and then on a weekly basis. The method aims to deliver only the particular nutrients needed, no more and no less. Plants need 16 nutrients to grow. They get three of these (carbon, oxygen, and hydrogen) from the air. The other 13 come from the soil. If you live in an area with poor soil, this can make it difficult to grow vegetables. To be certain the plants are getting all the nutrients they need, regardless of the condition of the local soil, Mittleider developed a custom fertilizer blend that supplies all the nutrients in exactly the amounts needed. Three of these nutrients (N-Nitrogen, P-Phosphorous, and K-Potassium) are supplied by conventional balanced fertilizer. The other 10 are supplied by the Mittleider micro-nutrient mix. All the ingredients in the Mittleider fertilizer are safe and can be handled without any special equipment, and purchased at any garden supply or hardware store. Frequent and consistent watering is key to the Mittleider system. 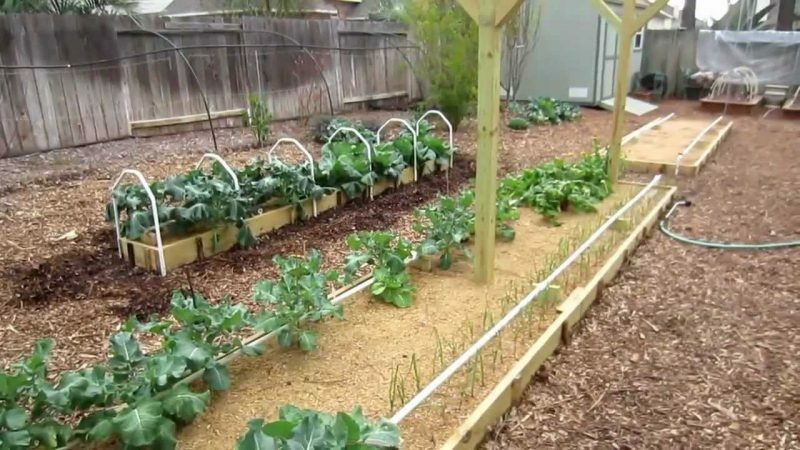 Grow Beds are constructed to allow easy watering with just a garden hose. An automated watering system, which aims the water directly at the plant roots is also often utilized, especially with Grow Boxes. This cuts down on the labor involved in watering, and also saves water. The plants are also pruned and trained in a specific way to maximize yield. The Mittleider method claims to dramatically increase yields. Some sources claim you can increase yield by 6 to 10 times and that you can grow enough produce on 1/8 acre to feed a family. 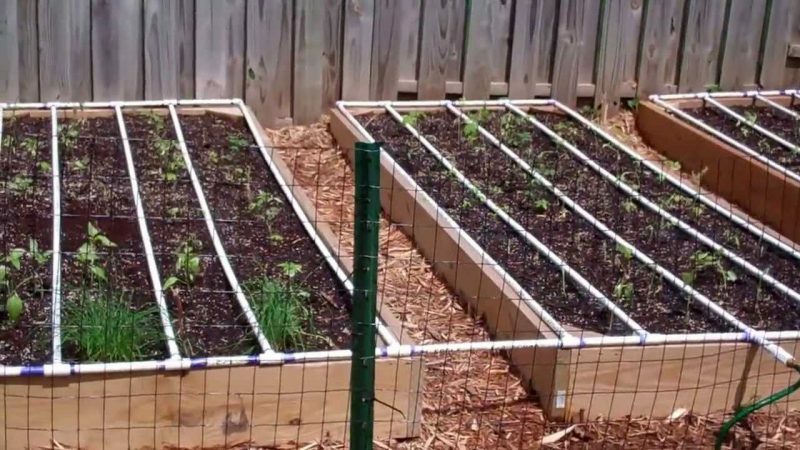 There is a certain amount of initial set up involved, but, especially for a Grow Bed, it does not require unusual tools and materials are inexpensive. Like any gardening method, this one has advantages and disadvantages. These lists should help you decide if the Mittleider gardening method is the right one for you. Concerns about the cost of fertilizer do not stand up to scrutiny. The basic fertilizers (such as a balanced 16-16-16 N,P,K water-soluble formulation) needed are inexpensive and easily stored. The custom micro-nutrients can either be mixed by the grower, or bought inexpensively from the Food for Everyone Foundation. A $14 bag of micro-nutrients, mixed with inexpensive base ingredients, will make 30 pounds of weekly feed. This is enough to feed 210 tomato plants for an entire season. While using commercial fertilizer is not part of the organic gardening method, the main concern most gardeners have is not using pesticides. The Mittleider method can be done without pesticides, using natural pest and disease control. All of the mineral nutrients used in Mittleider fertilizer are natural and approved by the USDA for use in organic gardening. Plants cannot tell the difference between the nitrogen found in conventional fertilizer and the nitrogen in an organic fertilizer like compost or manure. However, manufacturing conventional “chemical” fertilizers creates toxic waste products, uses non-renewable resources, and is energy intensive. This makes some people reluctant to go the conventional fertilizer route. If you are not at all willing to purchase commercial fertilizer, this method can be adapted to use manure tea. 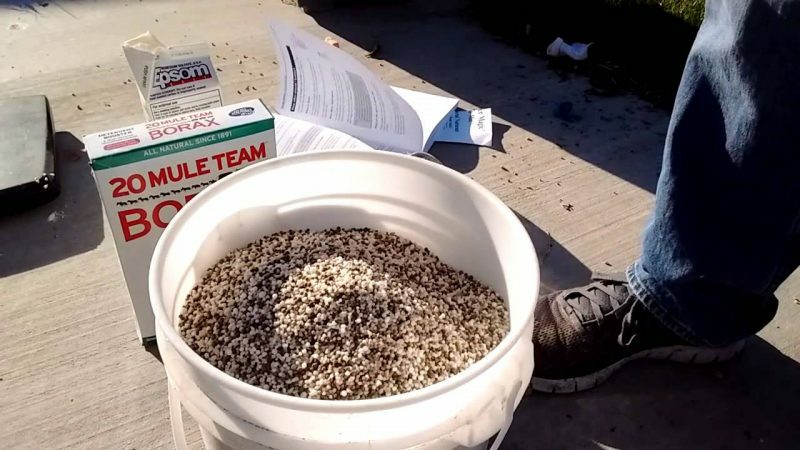 There are books available from the Food for Everyone Foundation about gardening without fertilizers, but this is a more advanced variation of the method. To get started with the Mittleider method, you’ll need to do some preparation before the start of the growing season. You’ll be starting most seeds in a grow house, and your Mittleider beds should be ready to receive the plants when they are the right size for planting out and the weather is right (past the last frost date in your area). It could take as little as a weekend to set up a Mittleider bed, but if you are starting from scratch and don’t have a lot of experience building things, you might want to give yourself several weekends to do it. The main consideration for siting your Mittleider beds is sunlight. Vegetables need full sun to thrive. Pick a spot that will receive 6-8 hours of full sun during the growing season. To make the best use of the sun, a long bed or box should be oriented running from North to South. This will keep the plants on one side of the bed from shading those on the other side. Unless you are using relatively small containers, you will need to be able to reach your garden bed with a hose. Grow Beds can be watered manually with a hose, but Grow Boxes will need to have a hose hooked up to a system of perforated PVC pipe. 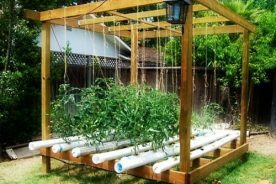 A PVC pipe system can also be used with a Grow Bed. There are two main alternatives for setting up a Mittleider garden: Grow Beds that use the existing soil and grow boxes, which create an enclosure for a custom soil blend, either on top of the natural soil or in a container. A Grow Bed requires no materials and is quicker to set up. Mittleider claimed that crops could be grown in any soil, but if there is a problem with contamination, disease, or weed infestation, a grow box is probably a better solution. Grow Boxes use a “soil-less” mix, such as sawdust and sand. A Grow Box can either be placed on the ground or be stand-alone container. It used If you are growing on a patio or want a bed that requires absolutely no bending (as for someone in a wheelchair), you will want to use grow boxes. Grow boxes work best with a watering system using PVC piping to create micro jets of water aimed at the plant root zone. The method can also be adapted for use with containers. Grow beds or containers need to be a minimum of 8 inches deep to provide enough room for the plant roots. You do not need a lot of space to create a Mittleider bed. Grow beds should be 18 inches wide. Grow Boxes can be either 18 inches wide or 4 feet wide. These sizes allow for the most efficient placement of the plants. 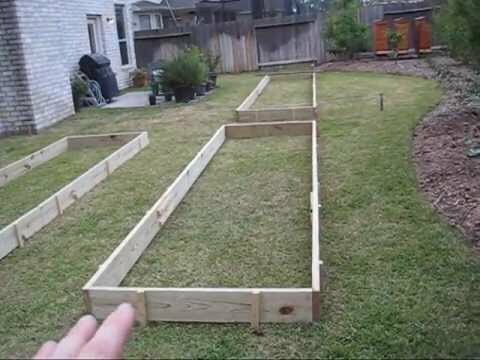 Grow beds and boxes can be any length, but 30 feet is probably the longest you would want—watering a longer bed would be problematic. You will want to have walkways between your beds or boxes. These should be between 3 and 4 feet wide. You want to be sure you can reach the middle of the bed or box from either side. You will never walk on a Mittleider bed, and you will need to reach into the middle to tend the plants and deal with any weeds, although these should be few and far between, especially with a Grow Box. Believe it or not, you do not have to worry about what kind of soil you have when siting your garden. 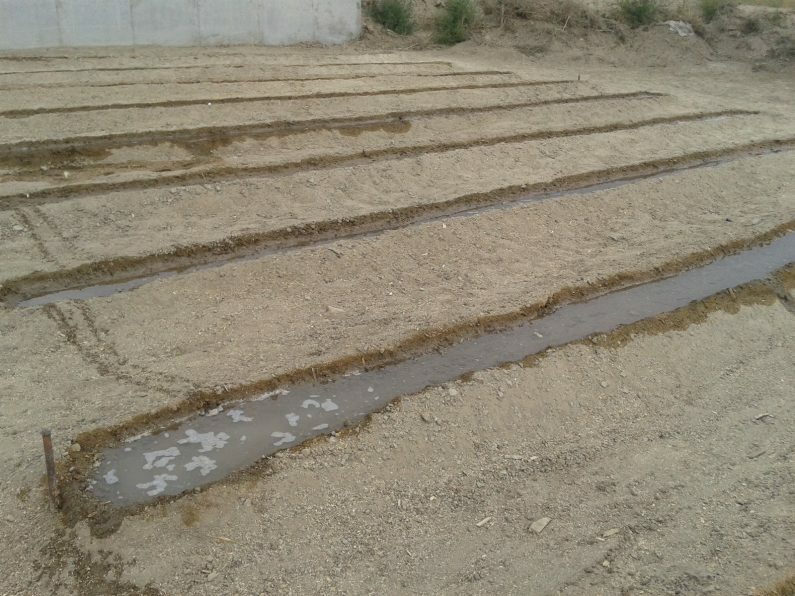 Mittleider experts say that this method can be used in sand, clay, gravel, or infertile soil. Aside from contamination, the only thing that would be a real problem is boggy ground that is constantly saturated. This would require a lot of drainage work. Vegetables want to be consistently moist, but the ground should not be saturated and wet. Add 1 oz. of pre-planting mix and 1/2 oz. of weekly feed mix per foot of length to the bed, and mix well into the top 8 inches. (See the FAQ section below for details on these two fertilizer mixes). Level your beds from side-to-side and end-to-end. It is most important to insure that the end of the bed where you will place the hose is level with or very slightly higher than the far end of the bed. Using a hoe and/or rake, move soil from the middle of the bed to the edges, to create mounds along the sides and ends of the bed that are 4 inches high and 4 inches wide. This will leave you a 1-foot area between the mounds. This is where you will plant. Re-level the center of the bed. Water thoroughly. This is done by flooding the center of the bed. Use a garden hose with a rag wrapped around the end to reduce the pressure of the stream. Determine whether you will plant seeds in the bed or grow or purchase seedlings. This will depend on several factors, such as the length of your growing season and the type of vegetable you will be growing. Whether you start with seeds or plants, you will want them located at the edges of the beds, close to the mounds. This leaves space in the middle for application of the fertilizer, and provides easy access from the edge of the beds for pruning and harvesting. With the Mittleider method, plants can be placed fairly close together. The method recommends training plants to grow vertically as much as possible, to maximize sun exposure and the amount of food produced per square foot. Grow boxes require some skill with building with wood. Detailed instructions are beyond the scope of this article, but can be readily found in the literature available from the Food For Everyone Foundation, or elsewhere online. An 18” box can hold one row of climbing plant or very large plants, and 2 rows of plants such as bush beans. A 48” wide box can hold twice as much. Set up PVC piping that can be connected to a water source and runs between the rows of plants. An 18” bed will need one pipe, while a 48” bed will need 2. Drill 3 rows of very small holes (use a 1/16” or number 57 drill bit) in the pipe. The rows should along the bottom of the pipe in the middle and 30 degrees on either side of the middle. Drill the holes every 4 inches. You can either start seeds in the bed or use seedlings. If starting seeds, cover them with sand rather than soil. In an 18” wide box you can plant one row of climbing plants in the center, alternating sides of the irrigation pipe, or two rows of plants, one on either side of the irrigation pipe. Because of the targeted watering and feeding, plants can be placed closer to each other than with other methods. Always water seedlings immediately after planting to avoid shock. Plants should be watered regularly to keep the soil most (but not wet) at all times. A wilted plant is already extremely stressed and this will negatively affect its health and productivity. In hot dry weather, this will mean watering daily. 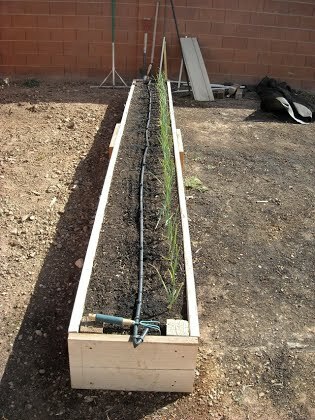 To water a grow bed manually, turn on the water source and flood the bed to a depth of one inch. Then turn off the water source and let the water seep into the bed. It should take only a few minutes to flood even a long bed. Watering this way avoids wetting the plant leaves, which cuts down on the likelihood of disease like powdery mildew. To water a grow box with an automatic system, you should aim to water frequently in small amounts. You can’t measure the amount of water that comes out, so you have to gauge it so that the soil stays moist but not soaked. In very hot dry weather, you may want to water twice a day, for just a short time (this could be for as little as a minute). *Use lime if your area received more than 20 inches of rain per year. Use gypsum if your area receives less than 20 inches of rain per year. The plants should be fed weekly with the weekly feed mixture (see the FAQ section below for details). Weekly feeding with the recommended blend of nutrients is the foundation of the Mittleider method, and is key to its success. Be consistent—feed on the same day each week. If planting seeds, begin feeding when the plants have one or two sets of regular leaves. If planting seedlings, the first weekly feed should be given 3 to 4 days after planting. Feeding is easy. To feed, sprinkle ½ oz. per foot of length of your bed in the center of the bed, between the two rows of plants. Then either flood the bed as you would when watering regularly, or water as usually using the PVC pipe system. For single-crop vegetables (corn, beans, peas, potatoes, root vegetables), continue feeding until 3 weeks before harvest. For ever-bearing plants (Peppers, tomatoes, cucumbers, eggplant, squashes), continue feeding until 8 weeks before the end of the harvest (typically the date of your first frost). The secret to keeping weeds down in a Mittleider bed is to nip them in the bud. Remove weeds as soon as you see them sprouting, both from your bed and from the pathways. This is the easiest time to remove them, and will prevent them from using up nutrients you want to save for your vegetable plants. This is most easily done with a stirrup hoe or other two-way hoe. If you are vigilant about this at the start of the season, you should have weed-free beds after a few weeks. The Mittleider method is focused on maximizing production. Therefore, all excess vegetation is pruned from plants so the plant will not waste energy and nutrients on it. 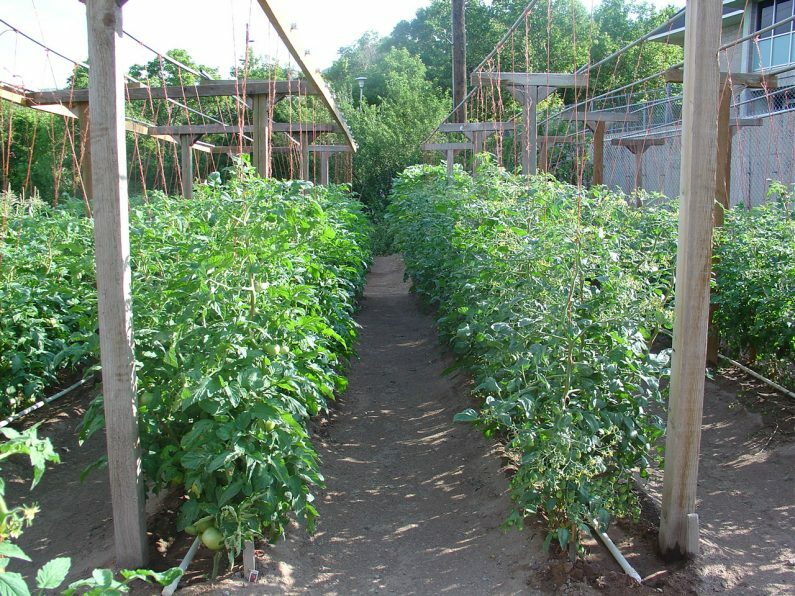 For example, tomato plants should be limited to one central stem, and the leaves that grow in the space where a leaf meets the stem (often called suckers) should be removed. Similarly, once a vine like a cucumber or melon has a blossom, the end of the vine beyond the blossom should be nipped off. In the interest of producing the maximum amount of produce in the smallest possible space, plants that can be trained vertically should be. This includes tomatoes, pole beans, peas, cucumbers, squashes, and melons. 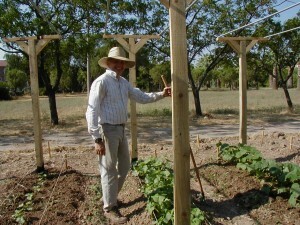 There are numerous methods for training plants to grow vertically, and any can be used, although the Mittleider books recommend a series of “T-posts” that support a rectangular frame about 6 ½ feet above the bed. Strings can be strung between this and a wire at ground level, to provide support for any type of plant. After your vegetable plants have stopped producing, with this method you remove all the plant residue from the garden. 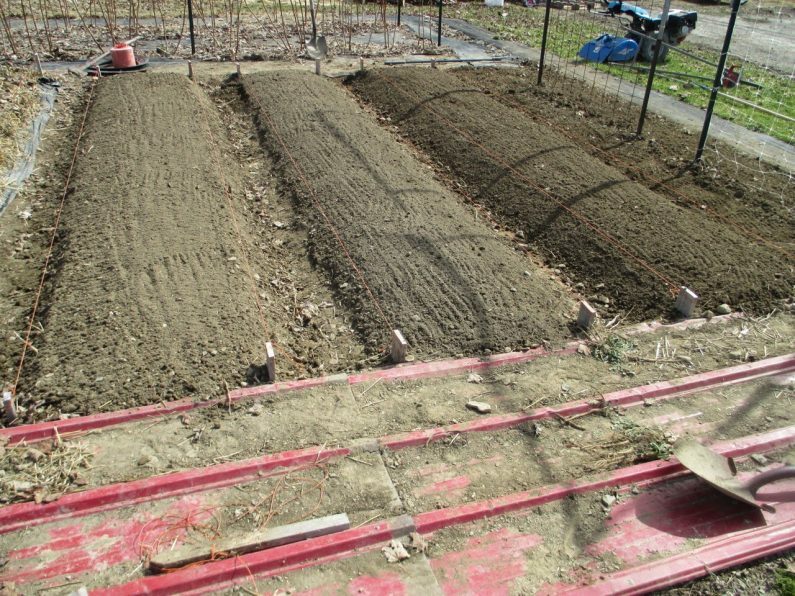 You will re-till the bed before planting the next season. If you are looking for a foolproof gardening method, the Mittleider method is worth your attention. It is ideal for the scientifically inclined gardener as well as the complete novice. It takes all the guesswork out of growing vegetables, and can be done very inexpensively. It can be done anywhere, from a desert to a parking lot, and can produce a high yield in a minimum of space. It works best using commercial fertilizer, but can be adapted to be strictly organic by using manure tea. What kind of plants grow best using this method? This method is best suited to vegetables and berries commonly grown by home gardeners. Examples include tomatoes, carrots, onions, peppers, peas, beans, kale, lettuce, cabbage, broccoli, corn, cucumbers, melons, blackberries, strawberries, and raspberries. Some of the techniques can be adapted for other plants, such as flowers, fruit trees, and perennials. 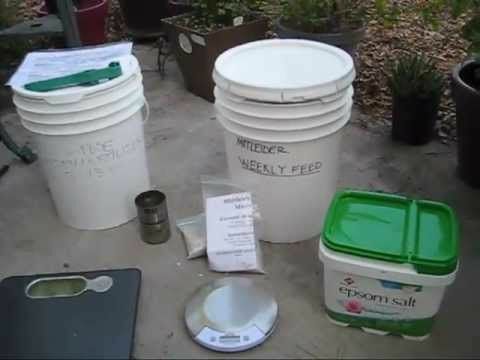 What do I need for the Mittleider gardening fertilizer? 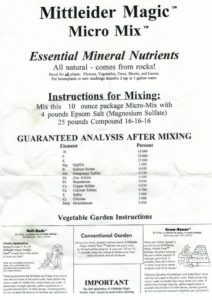 There are two fertilizer mixes used in Mittleider gardening. The pre-plant mix and the weekly mix. Both are easily mixed at home, and most of the ingredients are easily available from local garden centers or hardware stores. The most important part of the Mittleider method is the blend of micronutrients that is added to a commercial balanced (13-13-13 up to 17-17-17) N,P,K fertilizer. While it is possible to mix these micronutrients oneself, that would be costly and time-consuming. The mixture is available online from the Food for Everyone Foundation for around $14.00 a package, which is enough to make 30 pounds of weekly feed mix. This should be plenty for most home gardeners for an entire season. Do I need to test my soil? With the Mittleider method, there is no need to test the soil. The pre-plant mixture and weekly feed will provide all the nutrients your plants need, regardless of the nutrient value of the soil they are growing in. Because the plants are being fed all they need, deficiencies should be non-existent, and disease, which is often a result of nutrient deficiencies, is greatly reduced. Should I be worried about putting chemicals on my garden? 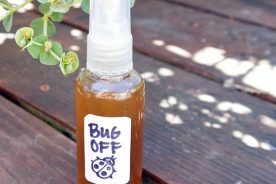 The popularity of organic gardening methods has caused some people to worry about putting chemicals on their gardens. There is nothing dangerous about the conventional PKN fertilizer or the Mittleider micro-nutrient mix. You can think of them as the plant equivalent of a multi-vitamin. There is no evidence that a plant can tell the difference between the nitrogen it gets from manure and the nitrogen in a PKN fertilizer. The ingredients in Mittleider fertilizer are not at all toxic if handled correctly. They are safe to store and use, and can be purchased at local garden supply or hardware stores. The Mittleider method tends to cut down on pests and disease, so there is little need for pesticides, which are the really toxic substances. What about fertilizer runoff or buildup of salts in the soil? Fertilizer runoff from large commercial agriculture operations can be a big problem, largely because the fertilizer is applied infrequently and in large amounts. The Mittleider method involves frequent, targeted fertilizing with a small amount of fertilizer. Even in gardens that have been using the method for 20 years, there is no evidence that the fertilizer has contaminated the groundwater. Claims have been made that using conventional fertilizer leads to the buildup of toxic salts in the soil over time. Soil testing has been done on gardens that have used the Mittleider method for 20 years, and no buildup of toxic salts has been found in the soil. Are vegetables grown with the Mittleider method as nutritious as those grown organically? Because the Mittleider method provides such precise nutrition for the plants, the vegetables are guaranteed to have the optimal mix of nutrients in them. The main source of information about the Mittleider Gardning Method is the Food For Everyone Foundation, whose website at GrowFood.com offers a huge amount of information, and offers for sale books and DVDs that completely explain all the details of the method. They also sell Mittleider’s special micronutrient mix. There are also numerous websites and YouTube channels devoted to Mittleider gardening, and a Yahoo! 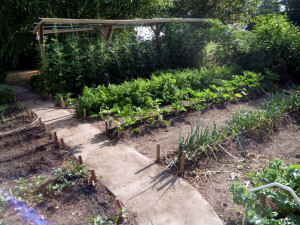 group called “Vegetable Gardening – Mittleider Method”, where you can connect with others who are interested in the method.